Last fall I competed in a charity powerlifting meet held at my gym. Coming out of retirement was the best thing I could do to challenge myself. 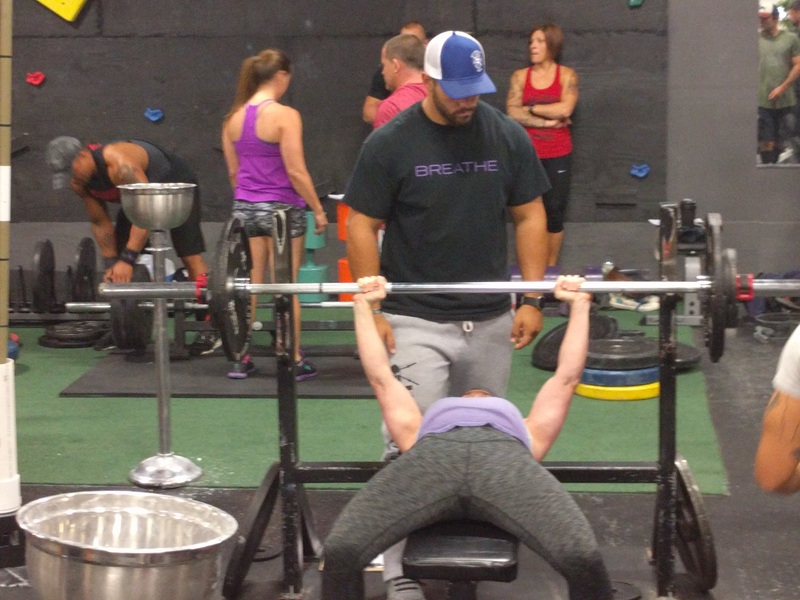 Powerlifting consists of three lifts, the deadlift, the squat and the bench press. Amongst women, squats are universally beloved, deadlifts are enjoying a CrossFit resurgence, but the bench press’ popularity is about the same as Congress. I’m here to say it’s time to take back the bench. Push-ups are not enough, you need variety to challenge the muscles including the chest. Ignoring muscles groups is not a good idea if you want to fire up your metabolism. Get the form down first. Go super light, by using just the bar or even just a broomstick. 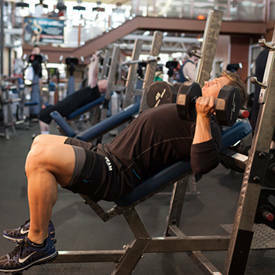 There are a variety of angles you can use by adjusting the bench from decline (hitting the lower portion of the chest) to flat to incline (hitting the upper chest) and with each, your form needs to be on point. Avoid relying too much on your secondary muscle groups – shoulders and triceps. StrongLifts has a terrific definitive guide to the bench press. Read it here. Again, start with light weights. Don’t add more weight until you can hit 12 reps with good form. Hitting PRs (personal records) on the bench is an incredible confidence boost because it takes a more mental focus and the numbers don’t go up as fast as the other big lifts. Keep notes on your phone to track your numbers. PRs are motivational and it’s fun to see how far you’ve come. As usual, we’re focusing fast productive 30-40 minutes workouts to get this done before the workday, so it’s a piece of CP’s recommended workout, not the entire routine. Also, Powerlifting Stefi Cohen who can deadlift 500lbs worth of Owen Wilson heads! We are always looking for chapter books that appeal to our 6-year-old twin boys for shared book reading. Whether it’s on the couch, in the hammock or a bedtime story. We can’t get enough of a good series that keeps us looking forward to what’s going to happen next. The fourth book came out January 30th. If you haven’t read the first 3, we highly recommend it. The Upside Down Magic series is about a group of misfits that learns to foster, embrace, and celebrate their differences. Nory can’t control her wonky magic and turns herself into a dritten (yes a dragon/kitten hybrid) instead of a perfectly formed cat. After many misadventures, she learns being out of the ordinary is extraordinary. It’s a great read to support kids who are just starting school and provides teachable moments for embracing differences in learning styles and abilities. Looking to amplify learning from shared book reading? Here is a research-based strategy to explicitly teach vocabulary, it’s called Text Talk. I use this with my kids, preschoolers, and Kindergarteners. It’s easy and fun, the kids eat it up! Find a Tier 2 word to teach your children. Provide a simple definition of the word. Have the child(ren) repeat the word. Take turns using the word in different context with your child(ren). It’s the third day of the new year. We’re bringing many of the same challenges with us from the previous one. Staying healthy with kids is hard and being productive is impossible. 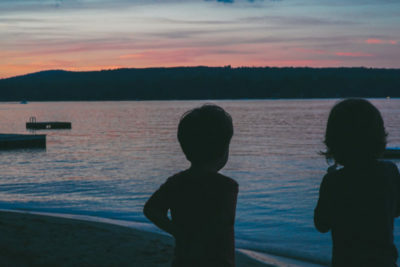 We’ve listened to hundreds of podcasts over the year and here are four takeaways to help us be better parents and hopefully have kinder, happier kids. Teach your kids to be optimists. Your kids Don’t owe you anything. You chose to have them. These first two are from Mike Maples Jr’s podcast interview with Tim Ferris. You can’t be grateful and angry at the same time. Focus on gratefulness and be sure to ask your kids what they are grateful for daily. Focus on technique and not competitiveness. Being competitive is natural. We hope to explore each of the four, more in-depth in future posts but let’s focus on the Gratefulness Happiness Link with a Ted Talk. From Ted X: The one thing all humans have in common is that each of us wants to be happy, says Brother David Steindl-Rast, a monk and interfaith scholar. And happiness, he suggests, is born from gratitude. An inspiring lesson in slowing down, looking where you’re going, and above all, being grateful. Graphic novels are a great way to teach adolescents and adults social communication. Lorena Alvarez’s brilliant graphic novel, NightLights, demonstrates subtle but complex nonverbal language. The novel’s captivating visuals paint a landscape rich with social interactions. Did you know 84% of our communication is non-verbal language? It’s the downfall of using text messages when trying to start a romantic relationship. Scenes such as the one above demonstrated the hidden rules of social communication. These are the rules we don’t talk about but are supposed to know. There are a number of distinct social interactions we can pull from this single scene. They range from positive to negative, and some ambiguous ones up for interpretation. For example, Who is already in trouble? Who is about to get into trouble? Who has exciting news and how do we know? Which girl is interested in hearing this exciting news? This artwork pairs emotion with explicit tone via text. Nightlights follows a young girl struggling to find confidence and fighting off negativity. There is a distinct similarity yet opposition in the metaphoric character, Morfie. A subtle distinction that introduces internal perspectives. The possibilities for teaching social communication and thinking are endless. The story is a gripping metaphor. Vague enough for many readers to layer their own personal experiences. There are many graphic novels to choose from for all ages but Nightlights deserves to be highlighted. I have used this one with a wide range of clients. It has captured their attention as well as mine time and time again; allowing for repeated exposure which provides scaffolding opportunities and application of learned skills. A masterpiece in graphic novel literature and therapeutic materials! It’s no wonder parents wave the white flag and become short order cooks by making separate meals each night. One meal that ensures Child #1 will eat and another meal that Child #2 will eat, plus one for the parents. It feels like it takes three meals in one night for it to feel like a successful dinner. Be authoritative and set the menu, allowing input from family members. Family-style meals, keeping it simple. Stick to the meal time structure, if the kids choose to pass on dinner remind them it is their choice not to eat. If your child chooses something else, have them make it themselves. Remember, being authoritative means you provide the what (nutritious foods), they choose the how much and whether not. Fearless Feeding is a book about childhood nutrition that will calm and empower parents, provide step-by-step feeding guidance at every child development stage and teach parents the skills they need to get healthy meals on the table fast. BONUS: We love Gordon Ramsey’s YouTube channel, he’s generous with tips and advice as well as incredible recipes. Here’s a recent one where he shares some delicious lunch recipes for kids. Dying Eggs – What do These Sparkles Taste Like?